Tonight LantarenVenster has an American top jazz quintet in house. The Clayton Brothers Quintet was founded by alto saxophonist Jeff Clayton. 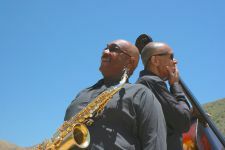 More than thirty years ago, he and his brother, contrabass player John Clayton, agreed to support each other’s careers. Jeff’s love for small occupations led to the formation of the quintet. John’s love for big bands led to the formation of the Clayton-Hamilton Jazz Orchestra, of which brother Jeff is also a part. The quintet released a total of seven well-received albums: It’s All-in-the-Family, The Music, Expressions, Siblingity, Back in the Swing of Things, Brother to Brother and The Gathering . The band received two Grammy nominations for best jazz album and collaborated with prestigious names such as Michael Jackson, Stevie Wonder, Charles Aznavour and Dee Dee Bridgewater.